Los Angeles Chargers cornerback Jason Verrett is expected to start in the season opener, following reconstructive knee surgery last October, according to Tom Krasovic of The San Diego Union Tribune. In addition to the knee injury in 2016, Verrett who was selected in the first round of the 2014 draft, also missed ten games in his rookie season due to a shoulder injury. 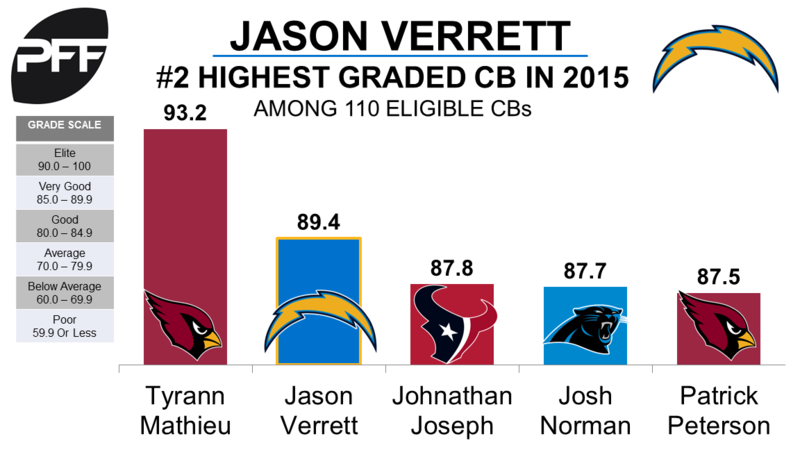 In 2015 Verrett started 13 games for the Chargers and posted an impressive PFF overall grade of 89.4, and a coverage grade of 90.2, both of which ranked second among cornerbacks. During that season Verrett allowed a quarterback rating (showing the standard NFL QB rating for passes into the player’s coverage) of 82.9, which was the 24th best in the league out of a total of 79 cornerbacks that played a minimum of 350 snaps. In 1,146 career snaps Verrett has missed just five tackles, and his 2015 PFF tackling efficiency (number of attempted tackles per miss) of 39.0 in the passing game ranked third best among cornerbacks.